This ECG was obtained from an elderly man who was complaining of acute-onset chest pain, radiating down his left arm. He also complained of a cough, and had audible rhonchi. 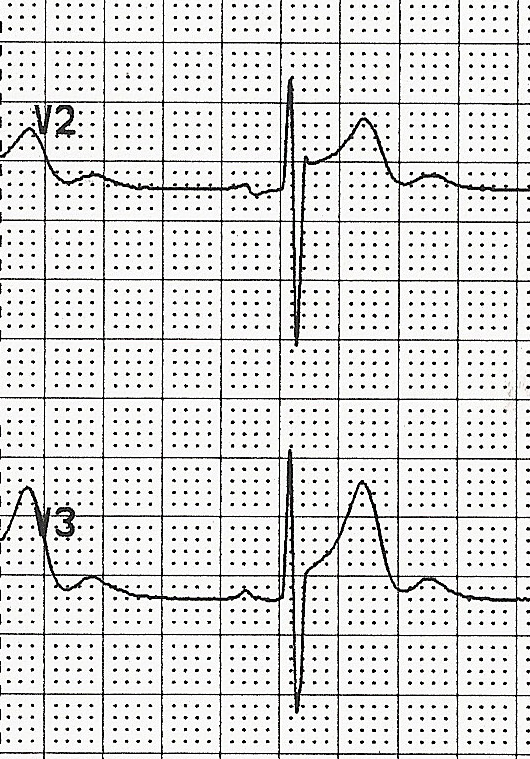 The machine interpretation gives several possible explanations for the widespread ST elevation noted on the ECG. The paramedics were a bit distracted by the machine's interpretation, and by the respiratory symptoms, and decided not to call a "cardiac alert" on the patient. They did, however, quickly transport him to the closest hospital, which happened to have full-service cardiac facilities. The patient was diagnosed with an acute M.I. and treated with angioplasty in the cath lab, with a good outcome. Afterward, the medics felt that they "overthought" this one, and should have given more weight to the patient's symptoms. Teach your students to evaluate their experiences with open minds and unafraid of self-criticism, so they may learn from every patient. This patient received excellent care, and the paramedics added to their "information banks", upon which they will draw for many years to come. Although the angiogram results are not available to us, it is plausible that a proximal occlusion of the LCA, near the bifurcation of the LAD and the diagonal, could cause ST elevation in V3 through V6, with mild elevation in Lead II (which is oriented to the leftward portion of the inferior wall), and ST and T changes in the high lateral leads (I and aVL).